Songs like finely hand-carved marionettes. 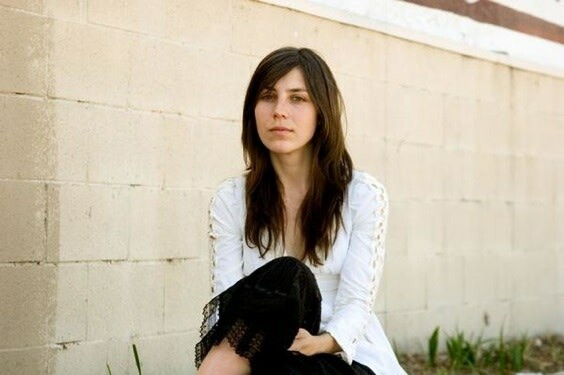 “No, I’m Julia’s sister,” answered the woman behind the merch table at Los Angeles musician Julia Holter’s recent stop at Holocene last Monday. “Oh,” we replied disappointedly, which quickly elicited a guilty confession from the seated young woman: “Yes, I’m Julia. I just get weird having to sit here and sell my own records.” Holter is visiting Portland for the first time in support of Ekstasis, her stately follow-up to last year’s rave-reviewed Tragedy, as part of a short west coast warm-up tour before heading off to Europe later this summer. Drawing comparisons to Laurie Anderson and tackling arcane lyrical subject matter, we couldn’t help but investigate the proceedings to see what all the fuss is about. But first, the openers. Behind towers of blinking lights, a twisting projection of Robert Smithson’s Spiral Jetty installation on the Great Salt Lake provided a pleasant, if facile, scene-setter for the night’s entertainment, belying the crisp digital syncopation of opening act, Cloaks. After a lengthy ambient intro, the Portland duo combined triggered samples that morphed upon each subsequent hit with programmed muted arpeggios courtesy of general MIDI, later moving into dense harmonic noise sprays and chaotic synth fizz that hovered over simplified, jacking house beats. Using universally effective dancefloor glue to anchor explorative and expressionist sound design like this, a la Villalobos, Vladislav Delay, or Wolfgang Voigt, has become a ubiquitous device for nascent producers’ bandwagoning the one-trick nostalgia of the 100% Silk cosmography, but I imagine it comes down to a simple, modern-day dilemma: what do you do when bearded synth bros get tired of barking up the same ol’ tree? Add a steady kick drum and voila: girls with glasses start coming to your shows. Another extended droning intro—this time with a brief balloon rubdown (followed by the inevitable, orgasmic ‘pop’)—gave us second act: Oakland weirdo Jib Kidder. Flanked by giant prop cigs and mannequin legs stalagmites, the dead-serious whimsy of Kidder’s art-school-performance-art was in full force, complete with a fascinating, expertly edited, character-driven video projection and pithy, Dylan-esque placards prefacing each song. While Kidder improvised song lyrics over countrified karaoke instrumentals, an amusing meditation on children punch-drunk on their own middle fingers in turn intoxicated the crowd. And though Kidder tested the audience’s patience with his runtime, his performance piece was easily the most entertaining part of the night’s show. The expansiveness of his imagination was a natural fit in the creative den of Holocene. Holter might be shy in person, but on stage she is keen to engage the audience—“We saw a rainbow today; it ended on a car!” she exclaimed in simple wonder in between songs—and she enhances the withdrawn isolation of her solo recordings with the help of a decidedly uncomplicated drummer and an adept, lively cellist, who add a welcome new dimension to her work. “Marienbad,” the lead track of her latest LP, Ekstasis, quickly whisked us into her world. Easily the most beautiful and emotionally transporting song she’s written, it moved from buoyant pop pomp to an agitated boil of vocal harmonies and shifting dissonance to baroque classicism in short order. Draped with a luxurious reverb, Holter’s voice was both delicate and sturdy, dipping occasionally into a deep pool of alto resonance, and the practiced precision of her keyboard playing was calm and unornamented. With her voice and keyboard controlling the dynamics of each song, the overall effect recalled a finely hand-carved marionette set into motion by a master puppeteer. In fact, the whole performance begged for the perfumed and coiffed audience of a proper concert auditorium, perhaps an ill-fit Holocene’s languidly nodding crowd. Next time, Julia, hope to see you at the Schnitz.